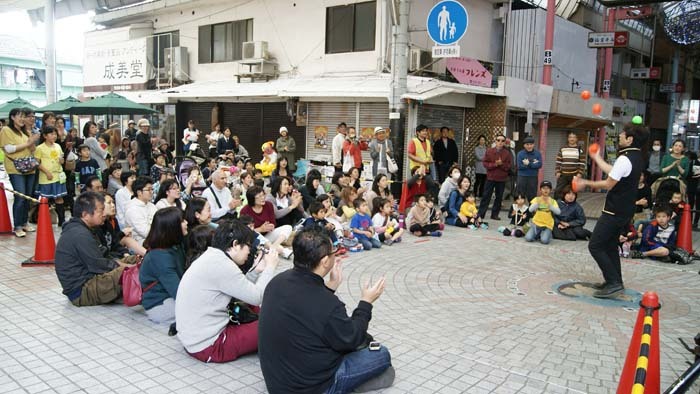 Juggler Tamanchu shows his skills in front of a street crowd..
A festival featuring six street performers is scheduled for this weekend at Hiyamikachi Machigwa Hall on the 2nd floor of Makishi Public Market 2F and the open space in front of Tenbusu Hall on Kokusai Street in Naha. Juggler Mr. BUNBUN takes a bite off his ‘tools.’. Four of the six performers are visiting Okinawa from other prefectures, and two are popular local performers. 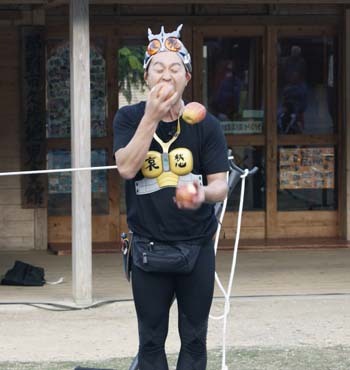 They entertain people with a variety of traditional street performances including juggling, pantomime, balloon art and pole dance. 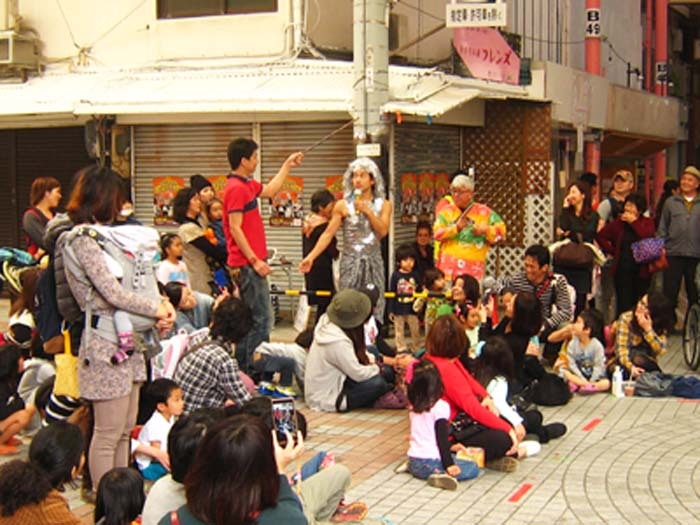 On both day, the performers are on stage at Hiyamikachi Machigwa Hall and at the open space on Kokusai Street in front of Tembus Hall, starting at 12:30 one after another, 30 minutes each. The festival takes place on Saturday and Sunday from noon to 17:00. Admission to he event is free. Organizer say that as no free parking is available in the area, people should park at coin parking lots and pay garages close to the event site, or use a public transportation. OSKa’s walking performance is popular.